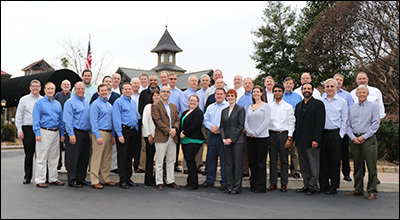 Members of the Digital Check and SmartSource sales and product teams together at our 2017 kickoff meeting – many of them meeting each other for the first time. Two years ago, today, on September 19, 2016, Digital Check announced one of the most important moves in our company’s history: The acquisition of the SmartSource scanner line from Burroughs, Inc. This was the boldest deal we’ve ever made – not only in terms of its dollar value, but also because of the incredibly complex task of combining two companies, each with its own product line, software, supply chain, and distributor network around the world. Just as importantly, we had to integrate the people (along with their many years of industry experience as competitors) into a cohesive whole. Not to mention, the combined company suddenly became the largest check scanner technology provider in the entire world, a title that carries new expectations of its own. Two years later, thanks to the tremendous efforts of everyone involved, we celebrate a new team that has harmonized faster than anyone expected. At this point in the acquisition timeline, many combined companies are still essentially operating as two separate entities whose only common trait is a name. But Digital Check, since we added the SmartSource team and products, has been operating as a unified company for well over a full year already. 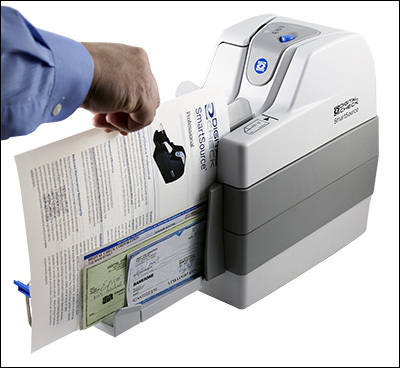 The SmartSource Adaptive (shown above with Digital Check branding) can capture mixed batches of checks and full-page documents – a capability that was missing from the Digital Check product line before the acquisition. Product line integration: All SmartSource scanners are now produced with the Digital Check name and logo – and more importantly, every model is available to all previous customers and distributors of both brands. Many of our various models filled the gaps in each other’s lineups; and all our sales and service people are knowledgeable about both lines as well. Combined engineering and manufacturing operations: Prior to the merger, all Digital Check scanners were designed and built at our plant in Southern California, while SmartSource had its own team of engineers and product designers in Plymouth, Michigan. The engineering group has moved to new offices in Novi, MI and we’ve successfully integrated our two teams. We get “the best of both worlds” in terms of the expertise applied across the product line. Worldwide distributor network: Prior to the acquisition, each of company did business with dozens of partners all over the world – now, nearly every Digital Check ISV and reseller is certified to sell SmartSource products, and vice versa. We now have a combined network of more than a hundred partners and distributors, who do business in over 110 countries on all six continents. Standardized cleaning products: One of the first things we did after the acquisition was to develop a single cleaning card that worked for all Digital Check scanners. Now the owners of any of our scanner models can use the same supplies without worrying about compatibility. Combined support and service: After a brief crossover period, all Digital Check support employees were fully trained on troubleshooting SmartSource scanners, and the service department at our plant in California began repairing SmartSource devices as well. Partners and overseas resellers are cross-trained on supporting our complete product line. We also increased the size of our help desk to accommodate new customers. Combined online ordering: It may seem like the distant past now, but all SmartSource products and supplies were moved over to the Digital Check web store within the first three months of the acquisition. We overhauled our old web store at the same time to include better organization of products, and faster ordering. Maintaining relationships: Most importantly of all, we managed to carry over the people who made both companies successful in their own right. Though some of our longtime team members have since retired, If you knew someone before the merger and were used to working with them, chances are they were still here afterward. This continuity helped our customers continue without missing a beat. It’s hard to fathom sometimes that all of this has taken place in such a short period. As we continue to move forward, we’ll soon begin to see the results of our first collaborations on new products and software designed from the “ground up,” and will continue leveraging our position as the market leader to bring you the most efficient, cost-effective solutions you’ll find anywhere. It’s been an exciting two years already – but the best is still to come!